The general term for a cyclone that originates over tropical oceans; at maturity, the tropical cyclone is one of the most intense storms of the world; winds exceeding 175 knots (324 kilometers per hour) have been measured, and the rain is torrential. an atmospheric vortex in the tropical latitudes characterized by low pressure at the center. Tropical cyclones differ from extratropical cyclones in origin, structure, and development. They are smaller, with diameters on the order of 100–300 km, and the pressure at the center often drops to 950 millibars (1 bar = 105 newtons/m2) and sometimes even below 900 millibars. Consequently, the pressure gradients in a tropical cyclone are very large, and accordingly the wind reaches storm or hurricane force. Therefore, tropical cyclones are subdivided into tropical storms and tropical hurricanes. The winds in tropical cyclones blow counterclockwise in the northern hemisphere and clockwise in the southern hemisphere, moving toward the inside of the cyclone in the lower layers of the atmosphere. In the higher layers, this wind convergence is accompanied by an even stronger divergence. Taken together, this leads to strong ascending air movement throughout the entire tropical cyclone region and to the development of a massive cloud system, with abundant precipitation and thunderstorms. Only a small area within the tropical cyclone, with a radius of 20–50 km (the eye of the storm), is free of a thick cloud cover. Tropical cyclones originate over the superheated ocean surface in the zone of intertropical convergence if the zone is at least 5° from the equator (so that the deflecting force of the earth’s rotation is sufficiently great). Of the many weak lows that occur in this zone, only about one in ten develops into a violent tropical cyclone. The average number of tropical cyclones each year is only about 80. The primary source of a tropical cyclone’s energy is the release of enormous quantities of latent heat as the water vapor in the ascending air condenses. Tropical cyclones move slowly, at speeds of 10–20 km/hr, from east to west (in the general direction of air transfer in the tropics), deflecting toward the higher latitudes. Upon reaching land, they rapidly dissipate. Some tropical cyclones move beyond the tropics, turning east as they do so, whereupon they begin to closely resemble extratropical cyclones. A tropical cyclone exists for periods ranging from a few days to two to three weeks. The high wind velocities, which sometimes reach 70 m/sec with gusts up to 100 m/sec, and the enormous quantities of precipitation, as much as 1,000 mm per day and more, cause sea swells and enormous destruction on land. Flooding occurs in the wake of tropical cyclones not only as a result of precipitation but also as a result of high waves driven by the wind against low-lying shores. The regions of origin for most tropical cyclones in the northern hemisphere are the Pacific Ocean east of the Philippines, the South China Sea (where they are called typhoons), the Pacific Ocean west of California and Mexico, the Atlantic Ocean east of the Greater Antilles, the Bay of Bengal, and the Arabian Sea. The main areas of origin in the southern hemisphere are the Pacific Ocean east of New Guinea and the Indian Ocean east of Madagascar and northwest of Australia. An intense depression in tropical regions during certain times of the year. 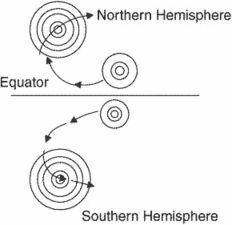 These are warm, core low-pressure systems in which the air circulates anticlock-wise in the Northern Hemisphere and clock-wise in the Southern Hemisphere. The center of the storm is an eye where light or calm winds prevail. Their name varies, depending on the region and the maximum speed within the storm. They are known as hurricanes in the Atlantic and the Eastern Pacific, typhoons in the Western Pacific, Willy Willies in the Atlantic waters, and Baguios in the Philippines. Though these processes typically negatively affect tropical cyclone intensification, tropical storm Lee was impacted by an unusually powerful blocking high-pressure system positioned in the interior Midwest of the United States. At the same time, projected increases in coastal population will continue to expose more and more people to tropical cyclone hazards, making preparations and evacuations more difficult and costly. The monsoon rains happen at almost the same time every year, so if a tropical cyclone develops on its leading edge, there is a narrow window of when it is most likely to hit the Arabian Peninsula. In many places, tropical cyclones are often accompanied by damaging high tides and flooding. Misra, DiNapoli and Powell calculated TIKE for each hurricane season, including all named tropical cyclones in the Atlantic from 1990 through 2011, and found larger TIKE values during La NiEa conditions and warm tropical Atlantic sea surface temperature conditions. Summary: TEHRAN (FNA)- A groundbreaking study showed that earthquakes, including the recent 2010 temblors in Haiti and Taiwan, may be triggered by tropical cyclones (hurricanes and typhoons), according to a presentation of the findings at the 2011 AGU Fall Meeting in San Francisco. PMD's Tropical Cyclone Warning Centre has warned the fishermen of Sindh and Balochistan in the open sea to return to the coast immediately. Appropriately titled "2008 Tropical Cyclone Review," the first summarizes last year's activity while including estimates of economic and insured losses sustained from each of the more significant cyclones after landfall. This is the basic surface structure of the coupled ocean/atmosphere in the tropical cyclone generation regions. The use of a multi-model ensemble of relatively high-resolution regional climate models has allowed us to detect, for the first time, a risk of tropical cyclone development over the Mediterranean Sea under future climate-change conditions," the scientific team wrote in an abstract to the report. The report offers two statistical models of the historical relationships between tropical cyclone activity and oil and natural gas production. RESIDENTS along stretches of Australia's northeastern coast were ordered out of their homes yesterday as a powerful tropical cyclone bore down on them, packing damaging winds and the threat of a devastating storm surge.